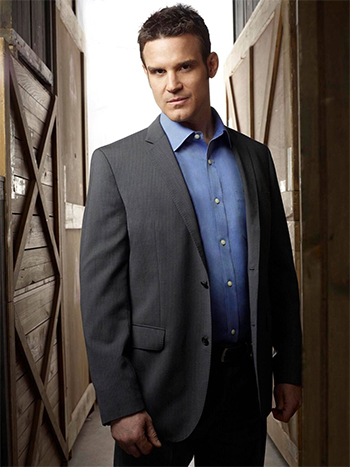 Eddie McClintock recently starred in USA Network’s conspiracy thriller Shooter as Jack Payne, a homeland security counterintelligence agent who works sharpshooting expert Ryan Phillippe, (Secrets and Liesand his former commanding officer Omar Epps, (House). McClintock also starred for 5 years on Syfy’s network most successful series Warehouse 13 and on Bones, returning for the final season’s special episodes. Eddie has also been seen on Supergirl, Agents of Shield, Backstrom, Modern Family, and Witches of East End. He was also seen opposite Nathan Fillion in the 2014 season finale of Castle. Among his many television credits, McClintock was memorable in multiple episode arcs of Friends and Desperate Housewives. An award-winning actor, McClintock received recognition from the Burbank International Film Festival as Best Actor for his performance in the feature films A Fish Story and Imagine. Prior, Eddie’s last on-air series found him starring with Jane Curtin, Fred Savage, and William Devane in the comedy Crumbs. Before that, he performed with Neil Patrick Harris and Tony Shaloub in Stark Raving Mad and also Scott Foley in A.U.S.A.